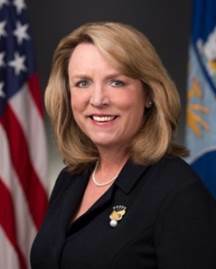 Deborah Lee James is the 23rd Secretary of the Air Force and is responsible for the affairs of the Department of the Air Force. Her duties include organizing, training, equipping and providing for the welfare of the Air Force’s more than 690,000 active duty, Guard, Reserve and civilian Airmen and their families. She also oversees the Air Force's annual budget of more than $110 billion. Ms. James has 30 years of senior homeland and national security experience in the federal government and private sector. Prior to her current position, Ms. James served in a number of capacities with SAIC - the Science Applications International Corporation. Ms. James also served in the Pentagon as the Assistant Secretary of Defense for Reserve Affairs and in the office of the Assistant Secretary of Defense for Legislative Affairs. Ms. James earned a Bachelor degree in comparative area studies from Duke University and a master’s degree in international affairs from Columbia University.